Just north of Gold Coast, Old Town is a low-key, always walkable neighborhood filled with a compelling variety of historic buildings, businesses, and people. It’s a great place to both live and visit, with an endless selection of restaurants, bars and entertainment, along with spaces where the community loves to gather. As your Old Town movers, we’ll help you navigate the narrow roads and driveways so you can quickly settle in to your uniquely remodeled home and go explore all this warm, classy and occasionally quirky neighborhood has to offer. Diverse in many senses, Old Town is home to about 36,000 people, equally split between men and women. Old Town dwellers live in singles, pairs, or as families. More people in Old Town have children than in many other neighborhoods in central Chicago. The median age is 36, the average income is $56k, and education levels are across the board, with many residents in process of completing their college degrees. Until 1900 or so, Old Town was known as “The Cabbage Patch,” a nickname that came from the main produce grown by the German farmers in the area. Over the following decades, the area developed and attracted residents from many different backgrounds. The “Old Town” Art Fair founded in the mid-20th century, along with local concerns for preserving and revivifying the original buildings in the area, contributed to the Old Town name the neighborhood has now. Now you’ve got the gist, here are some highlights—and basics—we found to help you start your best Old Town life. Lincoln Park: Easy beach and zoo access. Seward Park: Indoor and outdoor community programs. Chicago History Museum: Exhibits and events. Old Town Art Fair: 69 years and running. Every July. 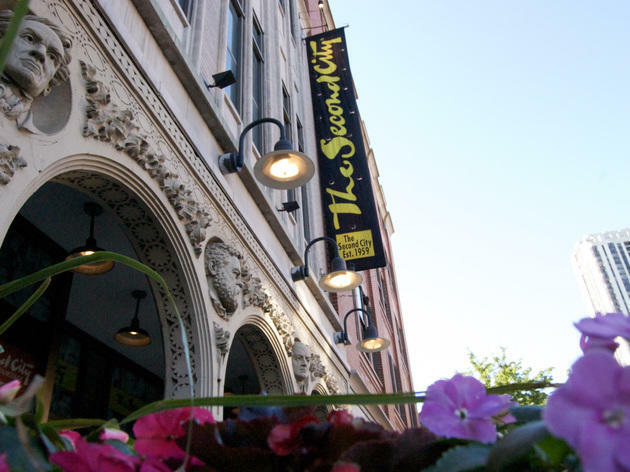 The Second City: Famous complex for comedy shows, classes, and public workspace. UP Comedy Club: Shows with dinner and drinks. Steppenwolf Theater: Established venue for contemporary productions. Red Orchid Theater: Events, youth programs, and original productions. Old Town Aquarium: Browse and buy exotic fish and supplies. Old Town Chamber of Commerce: For community news and events. Happy Camper Pizzeria: Order delivery, or enjoy from a tire swing at the bar. Old Town Pub: Sit in for game-watching. Italian: Topo Gigio Ristorante. Tuscan style. Japanese: Kamehachi. A long-running spot for sushi. Thai: Thai Aroma. Delivers, Chinese dishes too. Mexican: Adobo Grill. Table-side cocktails and guac. Tacos: Buzz Bait Taqueria. Specializes in fish. Barbeque: Twin Anchors Restaurant and Tavern. Comfortable space with a long history. Brunch: Nookie’s. Get there early. Famous chicken and waffles. Cocktails: Suite Lounge. Lamplit basement hideaway. Beer: Old Town Pour House. 90 on draft, plus full food menu. Dog friendly. Food: The Glunz Tavern. Classic with European roots. Game Watch: Old Town Social. Rent booths with private screens. Groups: Woodie’s Flat. Drink specials and tasty menu. Late Night: Burton Place. Open until 4am on weekends. Dive: Old Town Ale House. A staple for Second City fans and actors. Cash only. History: Marge’s Still. The oldest pub in Chicago. Opened 1885. Plum Market: All natural and organic. Cafe Intelligentsia: Includes a wine bar. Eva’s Cafe: Filled with armchairs and bookshelves. Cassava Cafe: Vietnamese coffee and smoothies. Popular study space. Lincoln Park: Many dog-friendly spaces. FFC Old Town: Equipment, classes, training. Outdoor pool memberships available. Flywheel Sports: Group spin classes. This has been a tiny sampling of the great things you’ll experience at your new Old Town home. As a seasoned Old Town moving company, we’ve learned all about the staples and cool places in the area. We’re happy to share more! As you’re planning your big move, cross one major thing off your to-do list, and book Old Town movers who’ll a take load of stress off your mind. Call us at New City Moving, and we’ll help you move safely, smoothly, and on-schedule, so you can settle right in and start living your greatest Old Town life.